So it turns out that the heatwave in the UK through much of June and July was pretty good practice for the heat of Tuscany in August! 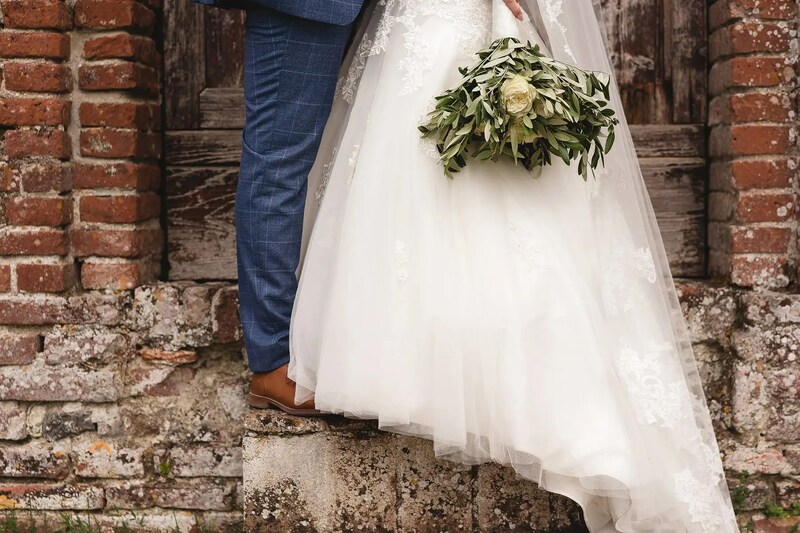 Today I wanted to show you Jess and Adam’s stunning San Galgano Abbey wedding from the beautiful Italian countryside near Siena. What an absolutely INCREDIBLE place to get married. San Galgano is essentially the roofless walls of a Gothic style 13th-century Abbey. And if you’re thinking ‘wow, that sounds cool’ well yes, yes it is. It’s bloomin’ awesome. 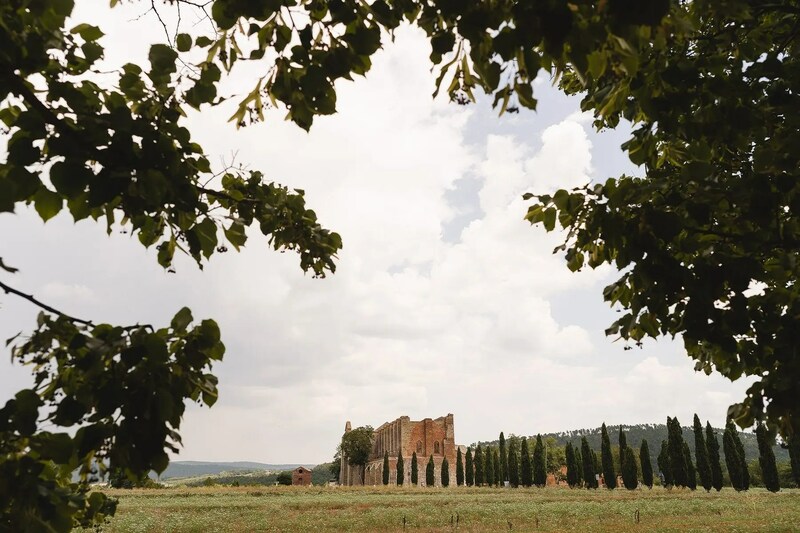 A ruined abbey in the middle of the beautiful Tuscan fields. Hello! The wedding day kicked off with me heading to the beautiful Tenuta di Papena, a villa perched atop a hill near Chiusdino. That’s where everyone was staying, getting ready and where the party was going to be later that afternoon. The amazing Lucy from Wiskow and White was on hand taking care of all the little details that needed arranging which meant Jess and Adam could relax and enjoy the morning! After a relaxed getting ready session I travelled down to San Galgano with the bridesmaids and arrived to see Adam looking relaxed and happy. I knew Jess’s arrival was imminent so I did that sort of weird run up to the front that wedding photographers have perfected where you move quite quickly but try to make as little noise / commotion as possible. I usually say something along the lines of ‘the ceremony went smoothly’ and it did, kind of. It’s just that the weather had other ideas … so half way through, there was a rather ominous rattle of thunder. And then a few minutes later the first few drops of rain started coming down. Everyone at the wedding quickly decamped to the tiny part of San Galgano that actually has a roof, and there it continued with the register signing and another reading. By the time Jess and Adam were married, the rain had stopped and the sky was bright again. Timing! We hung out by the Abbey for a little while to do some portraits and then headed back to Tenuta di Papena to get the party started. It was drinks and nibbles by the pool for the afternoon and then everyone moved up for dinner outside in the courtyard. I cannot imagine a more perfect place for a wedding meal. With festoon bulbs strung overhead it was just absolutely beautiful and the details looked gorgeous. Jess, Adam and Lucy had done an amazing job. The 5 course wedding meal got off to a flying start (literally – they were trying to do it a little quicker than normal as they were expecting some more rain). And they did pretty well I think. Everyone made it on to the third course before the heavens opened and everyone ran indoors for a little break! But again, the rain passed and everyone carried their chairs back out and got on with the meal! We were greeted with beautiful sunset so I crept off with Jess and Adam for a few minutes to get some pictures of them together. After that there was gelato (obviously) and the building of the wedding cake. This was a tradition I’d never seen before – Jess and Adam had to build their own wedding cake and then serve it to their guests which was great fun. I loved the chef outfits especially. Once everyone had finished with cake and ice cream we headed back to the pool for a pretty epic first dance and disco. An incredible end to a brilliant day. Thank you Jess and Adam, it was a blast being there with you guys!! Great coverage Sam. What a fab venue!